The Joint Direct Attack Munition (JDAM) GBU-31 is a tailkit under development to meet both USAF and Navy needs, with the Air Force as the lead service. The program will produce a weapon with high accuracy, all-weather, autonomous, conventional bombing capability. JDAM will upgrade the existing inventory of general purpose and penetrator unitary bombs, and a product improvement may add a terminal seeker to improve accuracy. JDAM can be launched from up to approximately 15 miles from the target and each is independently targeted. The weapon system allows launch from very low to very high altitude and can be launched in a dive, toss, loft or in straight and level flight with an on-axis or off-axis delivery. JDAM also allows multiple target engagements on a single pass delivery. JDAM provides the user with a variety of targeting schemes, such as preplanned and inflight captive carriage retargeting. Once released, the bomb's INS/GPS will take over and guide the bomb to its target regardless of weather. Guidance is accomplished via the tight coupling of an accurate Global Positioning System (GPS) with a 3-axis Inertial Navigation System (INS). The Guidance Control Unit (GCU) provides accurate guidance in both GPS-aided INS modes of operation (13 meter (m) Circular Error Probable (CEP)) and INS-only modes of operation (30 m CEP). INS only is defined as GPS quality hand-off from the aircraft with GPS unavailable to the weapon (e.g. GPS jammed). In the event JDAM is unable to receive GPS signals after launch for any reason, jamming or otherwise, the INS will provide rate and acceleration measurements which the weapon software will develop into a navigation solution. The Guidance Control Unit provides accurate guidance in both GPS-aided INS modes of operation and INS-only modes of operation. This inherent JDAM capability will counter the threat from near-term technological advances in GPS jamming. JDAM is not intended to replace any existing weapon system; rather, it is to provide accurate delivery of general purpose bombs in adverse weather conditions. The JDAM upgrades the existing inventory of Mk-83 1,000- and Mk-84 2,000-pound general purpose unitary bombs and the 2,000-pound hard target penetrator bomb by integrating a guidance kit consisting of an inertial navigation system/global positioning system guidance kit. There is some confusion over the precise designations of the JDAM family. The 1,000-pound variant of JDAM is designated the GBU-32, and the 2,000-pound version of the JDAM is designated the GBU-31. JDAM variants for the Mk-82 500-pound bombs are reportedly designated GBU-30 and GBU-38 according to various sources, though there is no indication as to what if any difference exists between these variants [indeed, it is possible that the association of the GBU-30 designation with the 500-lb Mk-82 is erroneous]. The JDAM kit for the Mk-81 250-pound bomb is reportedly designated GBU-29. Hard Target penetrators being changed into low-cost JDAMs included the 2,000 pound BLU-109 [GBU-31] and 1,000 pound BLU-110 [GBU-35]. Mission plans are loaded to the host aircraft prior to take off and include release envelope, target coordinates and weapon terminal parameters. The weapon automatically begins its initialization process during captive carry when power is applied by the aircraft. The weapon performs bit, and aligns its INS with the host aircraft's system. Targeting data is automatically down loaded to the weapon from the host aircraft. 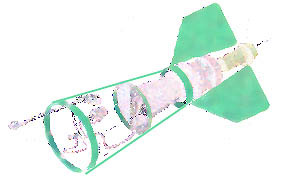 When the host aircraft reaches the release point within the Launch Acceptable Region (LAR), the weapon is released. Weapon maneuverability and range are enhanced by fixed aerodynamic surfaces (mid-body strakes) attached to the bomb body. The primary aircraft for integration and operational testing of the 2,000-pound JDAM were the B-52H and the F/A-18C/D. The F-16, F-14B, F-14D, F/A-18E/F, B-1, and B-2 are also operational users of the 2,000-pound JDAM. The 1,000-pound JDAM is to be tested and integrated initially on the F/A-18C/D, AV-8B, and F/A-22. The 500-pound JDAM is to be tested and integrated initially on the F/A-18C/D and B-2. The JDAM contractor has provided a 20 year warranty on the tail guidance kit. If it breaks, the contractor will fix it or replace it at no charge to the customer. In addition, the design is guaranteed to be maintenance free for its 20-year life and implementation will require no new support equipment or skills.